2010 is looking to be a very exciting year for dominant graphics card maker Nvidia as they release a plethora of new products aimed at driving future trends, starting today. From increasing the threshold of desktop graphics to dramatically changing the way users can experience the mobile revolution, Nvidia has put a significant amount at stake in their predictions for the coming trends. From what we at Skatter Tech have seen this year at CES, Nvidia looks to have a solid lineup and will definitely be a major player. Nvidia CEO Jen-Hsun Huang gave a private press conference in which he announced three new and exciting technologies Nvidia and partners will bring to market over the coming year. Building on the success of the Tegra architecture, Nvidia unveiled the Tegra 2 series of “system-on-chip” products. Citing the new mobile revolution, CEO Jen-Hsun Huang talked about the need and desire of consumers to have access to personal computing technologies on the go. Currently the mobile market is full of either weak products that have screens too small with too low resolutions or products that are too big, bulky, and fragile for consumers to effectively carry around. Like armored tank manufacturers, companies have to compromise to balance weight, power, and durability. 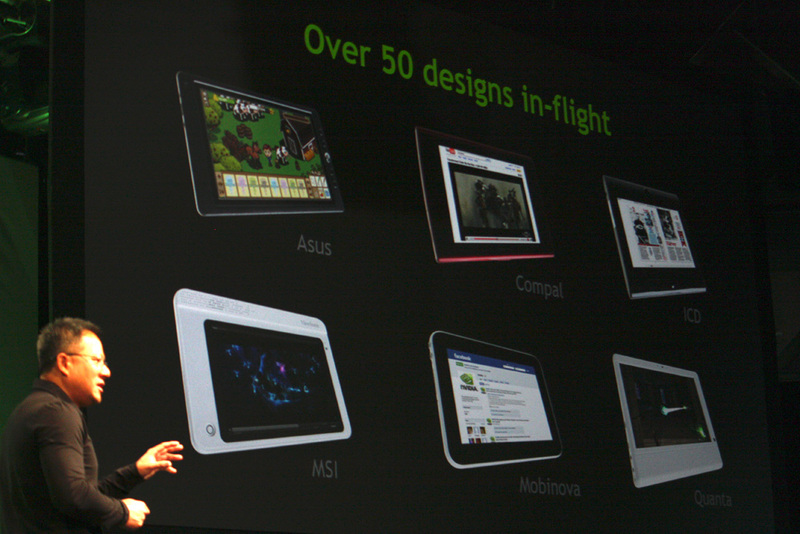 Nvidia’s answer is the Tegra 2. The Tegra 2 combines a CPU, GPU, memory controller, north bridge, and south bridge into a single chip. With eight independent processors, one would think the Tegra 2 will have a sizeable power draw, but this tiny chip draws a miserly 500mW of power. The frugal power draw will allow for, much-needed, longer battery life in mobile devices. Along with the low power consumption, Tegra 2 requires no extra cooling, passive or active, enabling manufacturers to utilize Tegra 2 in extremely thin designs. This powerful little chip comes in a compact approximately 2″ x 2″ package. The impressive graphics power of the Tegra 2 chips will allow users to watch full 1080p HD video on their mobile devices and dramatically improve their web browsing experience since web pages will no longer require down-scaling and can run at optimal resolutions. Nvidia showed us a demo of a Tegra 2 powered netbook running the Unreal 3 engine incredibly smoothly. This demonstrates that mobile users will soon be able to play games with graphics quality no longer being a full generation behind the most powerful desktop solutions. Simply put, the Tegra 2 will dramatically increase the opportunities mobile device manufacturers will have to create more powerful, smaller, and longer lasting devices. It will enable mobile device users to do what they did before, but much more efficiently. While the Tegra 2 won’t dethrone desktop graphics solutions by any means, it finally brings a major update to mobile graphics performance. Nvidia and Audi announced a partnership agreement at the press conference which will integrate Nvidia’s technologies into the luxury automobile manufacturer’s line of vehicles. Audi Chief architect, Mathias Halliger, talked about how the processing power of the new Tegra 2 chip will be used to drive information and navigation functions in new Audi vehicles. Audi brought in a demo drivers console and showed off the navigation system and graphical user interface they plan to implementing. Audi hopes to have all of its vehicles equipped with the Tegra 2 by 2012. Halliger also stated that Audi Group will also be implementing Tegra 2 into Lamborghini supercars which it also owns. Nvidia also showed off their 3D surround vision technology which can display games and media in 3D using their special glasses. With a major theme of conquering the z-axis at CES, Nvidia’s entry into the 3D market comes as major TV makers are also starting to offer products which display 3D picture. Nvidia has also enabled this technology across three computer monitors and has dubbed the technology “3D Surround Vision.” 3D vision will add significant depth to games and media completely changing the way we think in games and further adding realism to the experience. Nvidia mentioned that MSI, Asus, Viewsonic, Alienware, Samsung, and a few others already have plans on releasing 3D vision desktop and notebooks. They say that users will be able to watch 3D Blu-Ray movies and even certain YouTube videos in 3D. The Nvidia Booth: Fermi and 3D Surround Vision are here! When we arrived at the booth the Nvidia representatives we had just seen in the press conference earlier enthusiastically led us to their unveiling of the GF100. They had multiple machines running GF100 SLI configurations showing off games and demos with their 3D vision technology. The GF100 card itself is around the same size as current high-end video cards and we would estimate it at around 10″-11″. The GF100 was equipped with two dual-link DVI connections on the back along with a HDMI connection. We asked if Nvidia had plans to include DisplayPort connections like ATI, but were told there weren’t any. Internally, it has a dual slot cooler (the card requires two slots space) and requires a 6 and 8 pin power connector. Asking about the other features of the GF100, we were told how the CUDA architecture will allow programmers to run C++ on the GPU. We were also shown an Nvidia made “rocket sled” demo which demonstrated the graphics and PhysX capabilities of the GF100. In this demo you see an old space-race era rocket sled firing away down a track in the desert. Certain options allow for your to blow up the sled, make it crash, or stop it properly. Displaying the DX11 capabilities of the GF100 the rocks in the dirt as well as the mountains in the distance were beautifully done. PhysX power was displayed when the Nvidia rep caused the rocket sled to explode, sending our poor test dummy flying through the air and crashing in the barren desert. The ragdoll effects of the operator flying through the air and the dust with debris thrown up on contact with the ground were stunning and real with a haze left over that blew away with the wind. With a 40nm process, we asked the Nvidia rep if production numbers would be an issue as it has been with ATI chips, but the Nvidia rep replied that GF100 was in volume production now and that we would still see it on shelves this Q1 of 2010 around the March. While we couldn’t get any hard numbers, the Nvidia rep mentioned that the GF100’s pricing would be that of standard high-end graphics cards. We expect GF100 to be at least $400. Nvidia also had a demo of their “3D Surround Vision” technology which allows the GTX 200 series as well as GF100 series cards to display picture across three screens with Nvidia’s 3D vision technology. The setup they had running at the booth was powered by SLI GTX 285’s and was displayed across three projectors. 3D Surround Vision will require SLI GPU cards unfortunately unlike ATI’s Eyefinity, while not 3d capable, can display across three monitors off of just a single card. There’s more on this coming soon, so stay tuned!